This is the second part of an exploration into how anger can be channelled into powerful actions. 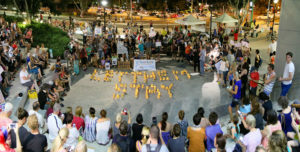 Part two comes from Brisbane, Australia where a simple vigil outside a hospital turned into a national flashpoint that overturned a decade of political consensus on Australia’s refugee policy. Remarkably, when they began the organisers of the vigil didn’t know what they were even aiming to achieve. What would you do if you were in charge of a country’s immigration system, and a 12 month old baby did this in an immigration camp you ran? NATASHA: She pulled a pot of boiling water onto herself while her mother’s back was turned. Off a table, inside the tent. HOST: If you answered, deport the baby to a tiny island nation with inadequate medical facilities, then you’re probably an Australian immigration minister. This is the story of Baby Asha, and the campaign to uphold the value of basic human decency. Sounds like a fairly uncontroversial idea, but in Australia, it’s anything but, especially when it comes to the issue of immigration. INTERVIEWER: What would have happened if she’d gone back to Nauru? ROS MCLENNAN: I fear she might have died. HOST: Welcome to ChangeMakers, supported by our Launch Partner Mobilisation Lab. I’m Amanda Tattersall. Today part two of our exploration of what happens when anger ignites a movement. In the last episode, I was in South Africa, looking at a movement that started out with throwing poo at a statue. It ended with students mobilising across the nation. Today, another story borne out of anger, that also led those involved to take direct action. It was a story with a sting in its tale. Ignited by anger, the students were driven into increasingly violent clashes with authorities. The students became very good at defending themselves from rubber bullets, tear gas and stun grenades, but in the process some felt they lost sight of what they were fighting for. Today, another story borne out of the anger, that also led those involved to take direct action. HOST: And just a couple of notes about this story. To protect their privacy, Baby Asha is a pseudonym. And during production, it was a race against time to interview some people in this episode before they were subject to a government mandated ban on discussing it. This means some of the interviews were recorded on the fly. So sorry if some of the recordings are a bit scratchy – but we have been restricted from going back to do follow up interviews. Our story starts in the moments after Baby Asha received severe burns to her body and face. Baby Asha had been imprisoned with her parents in a concentration camp on the small island of Nauru, a nation of 10,000 people in the South Pacific ocean. A place where medical facilities are, well, basic. As a result, whenever any major medical emergency happened, the Australian government had to medevac the patients on a Lear Jet back to Australia. And look, I know if you’re not from Australia, you’re probably having a hard time understanding this story. Yes, in my home country, we imprison babies in off-shore concentration camps. Even babies born in our country go there if they’re unlucky enough to be born to the wrong sort of parents. I don’t use the term “concentration camp” lightly, but that’s what they are. The Australian government intentionally makes the camps as awful as possible, so that families with tiny children live in sweltering conditions in tents with no air conditioning. They are a place to persecute a specific minority, and they are intentionally awful places with inadequate facilities. That’s a what a concentration camp is. And in case you’re wondering, just like other concentration camps throughout history, the people who are sent there have committed no crimes. The government justifies all of this because these people fleeing for their lives. They are refugees. Perhaps most shocking though is this: the deportation of a burnt baby back to a camp with scant medical services was likely to enjoy support politically from both major parties in Australia. Ellen Roberts was an activist at the time, and she says that actually, the minister was surprised when he met resistance to deporting a severely injured baby. ELLEN: that was standard practice and Baby Asha had not been the first baby treated at Lady Cilento and deported back to Nauru. I think what is more remarkable is why he had difficulty deporting Asha. So something shifted around that time that made this a real flashpoint. HOST: This is the story of what that flashpoint was. But before I can tell you that story, first a bit of context about how Australia got itself to this point. Many years ago, in 2001, a very masterful politician called John Howard started using refugees as a scapegoat to help him get re-elected. The previous election he’d done it with Australia’s indigenous community, and it worked. His method was simple: pick a minority group, ideally with brown skin, and accuse them of being criminals, or bludgers, or just deeply suspicious. The opposition party – who was on the left side of politics – would then leap to the poor minority’s defence, and Howard would then use that as proof that the the opposition was “weak” on whatever he was accusing the minority of doing. Weak on crime, weak on bludging, weak on national security. You get the idea. What Donald Trump has done with Mexicans and Muslims. And for Howard, in the heat of a six week election campaign, it didn’t really matter whether the allegations were true. As long as the mud stuck long enough for him to be re-elected, that’s all he needed. NEWS ANCHOR: This just in you are looking at a very disturbing live shot. That is the world trade centre. And we have unconfirmed reports this morning that a plane has crashed into the World Trade Centre. HOST: 9/11. Suddenly, in the public mind, refugees got mixed up with terrorists. It was a great piece of luck for Howard. And devastatingly unlucky for refugees. Dave Copeman ran a large coalition of many of the biggest community organisations in his city. DAVE COPEMAN: There had been stories in the popular press and talk-back radio that really portrayed asylum seekers as queue jumpers, as people who were rocking the system, as illegals, as people who weren’t to be trusted. HOST: The result 15 years later, is that a minister of immigration has sweeping powers, and the most vulnerable immigrants are housed off-shore, outside the reach of Australian laws. DAVE COPEMAN: There has been a long campaign of dehumanizing asylum seekers and of moving them out of Australia so that they’re out of people’s minds. HOST: Whereas many saw the whole politics of our country in a stale mate, Ros McLennan – the head of the union movement in the Australian state of Queensland – saw an opportunity when Baby Asha arrived on that Lear Jet. ROS: While many of us don’t buy the federal government’s alarmist hysteria over refugees and terrorists, some do, but everybody can relate to a mother’s worry about a seriously, seriously injured baby. HOST: After all, how much of a threat can an un-armed, severely-burnt baby be to national security? Natasha Bulcher was a case worker for people who were seeking refuge in Australia. She’d heard that a baby had suffered burns in the concentration camp on Nauru, but the government wouldn’t tell her where she was being taken. NATASHA: There’s a phone app called … Flight Radar and you can watch planes move through the sky, and where they’re going to. HOST: Her job was to represent the interests of Baby Asha and her parents. NATASHA: And we just figured out where the … best burns hospital was in Brisbane. INTERVIEWER: Wow. And so that’s how you found where she was. NATASHA: And that’s how we found -Yeah. And so we called a few different hospitals and hit the jackpot. HOST: Within days, Asha had been stabilised, although the medical staff didn’t want to send Baby Asha back to Nauru. NATASHA BULCHER: The doctor in the Burns Unit was fantastic. They seemed to have made the decision not to discharge her until we could have her legally secured. HOST: Problem was: thanks to all the laws they’d passed, it was up to the immigration minister to make the call. And he wanted her deported. So a small group of activists decided to hold a vigil in protest. Ellen Roberts was among the first down there. INTERVIEWER: How did you find out about Baby Asha in the hospital? HOST: Soon word spread. Ros McLennan was almost asleep. HOST: Then she saw who it was. Ged Kearney – the head of the Australian union movement. ROS: I thought it must be important, given the hour, so obviously I took the call. HOST: She told Ros that there were 10 people standing outside Lady Cilento Hospital. ROS: Because there was serious concern that Baby Asha and her parents were going to be taken back to Nauru, and Ged was expressing concern that these 8 or 10 people were out there in the night, and it would be good to give them a sign of solidarity or support, and if I could do it, I could. HOST: Friday night. What would you do? HOST: Once she got down there, Ros put the call out on social media. ROS: Other people came thick and fast throughout the night. HOST: One of the first people she called was Dave Copeman. DAVE COPEMAN: Ros McLellan called me on Friday night and she said get down here to the Lady Cilento, there’s a baby who’s been detained and we fear she is going to get sent back to Nauru. She’s an asylum seeker and we’re going to march in a vigil. HOST: As the hours ticked over into the early morning, Ros and Dave chatted about the sheer logistics of what they were doing. It was clear that for this vigil to have any impact, that they’d need more allies. So Ros asked other unions to support the vigil. HOST: The union movement swung behind Baby Asha. But why? What did Baby Asha have to do with workers’ conditions. ROS: The reason our members work is to provide for themselves and their families. Here, in another part of Brisbane, not too far from my house, is a mother desperately worried about her baby and what future for her baby’s health, wellbeing, and welfare, if the baby and her parents were moved back to Nauru. I just as a mother, as a unionist, I couldn’t have the capacity to make change at my fingertips and do nothing. HOST: And it wasn’t just unionists. Dave Copeman rang around the churches. DAVE: I called Dave Baker, the moderator of the United Church in Queensland and said we need support for this. And some of the local churches, Western Uniting Church, contacted the Catholic Archdiocese, Peter Arndt from the Commission of Justice and Peace, and I spoke to some of the community organizations we were involved with. HOST: As the days went on, instead of the numbers at the vigil falling, they went up. DAVE: Everyday pretty much we tried to organize and action, getting a couple of hundred people at the front of the hospital. In the kind of purpose-built, amphitheatre-style situation there. And we’d say, oh, let’s put out something on Facebook for tomorrow. And the hour would come around, and there’d be 200, 300 people. And there was just…it was. It was in the air. People had hope that something was going to change it. And they just thought I wanna be there, I want to be a part of this. HOST: A vigil was a great way to peacefully make sure that Baby Asha stayed safe. They knew that while she was in the hospital, she would be safe. HOST: But Baby Asha couldn’t stay in the hospital indefinitely. The government’s position was that once she was discharged, she would be deported. To do otherwise would undermine their ‘tough on refugees’ stance that had unwritten their electoral success for 15 years. Yet thanks to the Vigil, that was becoming a more and more unpopular stance every day. The problem was nobody knew what would happen next. It was a genuine stalemate. HOST: Baby Asha was stuck in the hospital. The government wanted to deport her, but the round-the-clock vigil outside was growing every day. Baby Asha’s case worker, Natasha Bulcher, was keenly aware that without a sophisticated communications strategy, the vigil was likely to fail – no matter how big it was. NATASHA: I think that the Department of Immigration and the minister’s office feel that they can ride out some campaigns to a certain extent. HOST: But there was a problem. What the media love are personal details. That was the key to getting people to empathise with the family’s plight. NATASHA: So in the asylum sector we have to be very, very careful… about informed consent and making sure that clients know what’s being done and are happy with the information that’s being shared. HOST: Luckily, Baby Asha’s parents trusted Natasha and agreed to let their situation be made public. NATASHA: So it wasn’t just an issue that was stagnant. The public was made aware of every step in this family’s journey, right. And they became invested in it. And I think that’s what resulted in such in such huge media coverage and such huge support, it’s that people were able to understand, day by day, what was happening to this family. HOST: It was a tough situation, that required real courage on their part. Essentially Natasha was asking them to stand up and oppose publicly the government that had crazy amounts of power over them. But they understood that it would help not just their family but everyone in their situation. Some days were better than others. NATASHA: Some days it would be as simple as Oh, Natasha, I don’t want them to know how upset I am today, don’t tell them that. Just tell them that I said thank you, you know. HOST: The head of comms was a man called Shane, and he understood that for the media to lap up the story, he had to humanise the family. Something Natasha had to get used to at first. NATASHA: I wanna tell the stories of your clients but what I want to tell is what their favorite food is and what the band they liked when they lived in Iran or when they lived in Sri Lanka, you know. And I was like, that’s not the important information, Shane. These people are suffering immensely and you want to talk about what their favorite cereal is? HOST: But the strategy worked. As the media coverage grew, public sympathy for Baby Asha grew too. The campaign was called Let Them Stay and it sought to use the Baby Asha case, to argue that the 250 refugees who were facing deportation to Australia’s offshore concentration camps should all be allowed to remain in Australia. Ellen Roberts helped run the campaign for GetUp, a large digital campaign organisation. She says that as the story dragged on with no resolution in sight, it allowed the campaign to broaden their sights further still. ELLEN: Really, it opened up the ability to talk about the conditions on Nauru and Manus. But it did it via the specific situations for those people. And it was in that time that we saw a massive shift. Polling at that time showed among the Australian people what they thought…what they thought like whether they thought that was an acceptable situation or not. HOST: Meanwhile, inside the hospital, the doctors — seeing the immense community support, strengthened their resolve. NATASHA: Once the campaign kicked off and there was a lot of support there, I think the doctors realized that they were able to do more with their leverage. And so they then said we won’t discharge her until she goes to a house in community. We don’t accept a detention center to be a safe place for a child. HOST: For a while, it seemed like the whole of Australia was focussed on what would happen to Baby Asha. ELLEN: On that Monday morning, we had a live TV cross, 2 live TV crosses. And so we gathered people round, you know,to show the world and the nation that there was all these people here. HOST: Then the following weekend, it suddenly seemed like the Government was going to try and get its way: by force. HOST: The fear was the government was going to forcibly remove Baby Asha using Federal Police. Outside, the protesters were split on how to react. There were views being offered about, “We don’t want to cause more stress and upset to Baby Asha and her mother. They’ve been through a lot. It’s been a long vigil.” There was a suggestion that perhaps we have a silent acknowledgement as Baby Asha and her mother were taken away from the hospital to be ultimately deported. That was one view. HOST: But there was another view. ROS: Another view was that people shout and scream and noisily protest and endeavour to get themselves arrested to draw public opinion. HOST: Ros had another idea entirely. HOST: Being a unionist, Ros and many of her cohort were used to pickets. But this was a very different type of picket. Instead preventing people getting in, it was to prevent one very special person, a tiny baby, from getting out. Still, they approached the logistical issues like they would on any picket. ROS: We identified the exits, the roads out of the hospital where Baby Asha and her mother could be taken. We organised into groups, we appointed a team leader, an offsider, in every group. We gathered the contact names, phone numbers so we could keep in touch with people who were leading the group at every exit. I explained that we needed to do was be on the lookout for a car. We had descriptions of the security uniform, so people knew what to look out for. HOST: To be effective, it required a hugely disciplined show of force. ROS: We explained to each group that what they were looking for was obviously a car with a mother and a baby in the car, and if we didn’t have eyes on the occupants of the vehicle, we were to move calmly and slowly into the road, stop the car, explain what we were doing in a calm way, eyes on the back of the vehicle, and when it was all good, we could move aside and thank folks for their time. HOST: It meant not letting anyone get through the blockade unchecked — no matter who they were. ROS: In one incident … a … colleague and I stopped a car that was a large, dark coloured car with tinted windows, which we thought looked like a suspicious vehicle. It was dark by that time, and it was being driven by two police. HOST: It took the Government by surprise. The next day, the Minister for Immigration announced that Baby Asha and her parents would not be deported. It was the biggest reversal in refugee policy in Australia for a decade. HOST: It was an extraordinary defeat for the government. Something that, when they started the vigil, they hadn’t imagined would be possible. DAVE: I think the main lesson for me is that it’s alright to take an action where you’re not sure where the end is if you know you’ve got enough people and resources, networks of people who are willing to support…That was quite a scary move and I…I’m not sure I would have had the courage to do what Ros did, to say that we were going to this so clearly with so few people there. But the lesson was that that worked. HOST: Let Them Stay was fueled by a growing sense of injustice that had been building for years, decades even. That was a very similar situation to the South African students we met in part one. But unlike those at the vigil, the students in the Fees Must Fall campaign forged their relationships on the battlefield, first through a series of occupations of university buildings and through bruising clashes with police in the streets. While they trusted each other in the heat of the moment, certain segments of students felt free to push the envelope further than others. There were radical elements in the student movement that freelanced off — some even demanded the overthrow of the entire government. This incoherent approach then led down the path of focussing almost entirely on the specific tactics they were using. They ended up spending so much time discussing how to fend off rubber bullets they forgot to discuss why they were using that tactic anymore. In contrast, the Let Them Stay campaign relied on bonds of trust that had been established well outside of the crisis flashpoint. Many of the unionists, church-goers and community activists who came together had known each other for years, brokered by Dave’s organisation. That led to a trust where bold, decisive action, taken in the moment was possible. But the direct action was deployed only to address the larger goal of Letting Baby Asha stay. Anger ignited both campaigns, but ultimately, Let Them Stay succeeded because their tactics served their strategy. It was long-standing relationships that made that possible, not just in the heat of the battle but in the months and years beforehand. DAVE: They stuck with it because they had trust in each other and they had trust in the organizations involved, that they would stick with each other and be true to each other. And that was the lesson for me…is that…building connections over organizations isn’t just useful for planned work, you know, that you agree on together and that you try to organize around. It’s really important so that you can react on an opportunity or to a crisis. And let us take a big risk together. It worked. HOST: Changemakers is hosted by me, Amanda Tattersall. Remember to subscribe to this podcast to catch all our episodes. Changemakers is produced by Caroline Pegram and Catherine Freyne. Written by Charles Firth. Our researchers are Tessa Sparks, Iona Rennie and Amy Fairall. Our audio producers are Uncanny Valley and our sponsoring organisations are Mobilisation Lab, Australia for UNHCR, GetUp.org.au, the Fred Hollows Foundation and the Organising Cities project funded by the Halloran Trust based at the University of Sydney.